The Hungarian Air Force (Hungarian: Magyar Légierő) is the air force branch of the Hungarian Defence Forces. There are 3 Air Force bases (AFB) in Hungary. 86th "Szolnok" Helicopter Base (86. Helikopter Bázis) based at Szolnok AFB. The 59th Tactical Fighter Wing is the fixed-winged part of the Air Force. The 59th consists of 2 Fighter plane Squadrons and 1 Transport Squadron. There are one Fighter Squadron in the 59th Wing, the "Puma" [cougar] squadron. Operating JAS-39C Gripens. The Hungarian Air Force is leasing-buying 14 JAS 39 Gripens, 2 of which are dual-seaters, for 12 years beginning in 2006 (later extended until 2026). By December 2007 all the 14 jets had been delivered. On May 19, 2015 one two-seater Saab JAS39D Gripen crashed at the end of the runway at the Čáslav AFB. 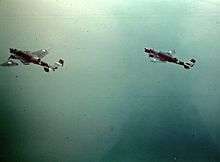 The pilots ejected safely, but the aircraft, nr. 42 with callsign PUMA66 was written off, damaged beyond repair. After the lease period expires, Hungary will own the remaining Gripens. This is the transport squadron of the 59th Wing. They operate 5 An-26. The An-26s are due to be replaced by new transport planes after 2016. The 86th Wing is the helicopter regiment of the Hungarian Air Force. The 86th consists of one Transport and one Attack battalion. The 12th Air Defense Missile Brigade is in charge of providing air defense to parts of Hungary. Mistral missiles, a French-made lightweight SAM system with dual launchers and radar sets mounted on Unimog all-terrain vehicles. 36D6 Tin Shield. All-altitude surveillance radar, modernized with domestically developed digital electronics suite. During the Cold War period communist Hungary had numerous SA-2, SA-3 and SA-4 batteries and a large number of radar installations, mostly tasked with defending the Danube line against NATO air strikes. Pápa Air Force Base was established as a military organization on 1 July 2001 as a part of national commitments in the NATO Infrastructural Development Program, and it is the legal successor of the HDF 47th Pápa Tactical Fighter Regiment. This table may include some aircraft that have been placed in reserve, or stored. 2 One JAS 39D (#42) crashed on May 19, 2015. With completely new system software fit, known as Version 19. One JAS 39C (#30) crashed on June 10, 2015. SAAB has delivered a replacement JAS-39D (#44) to Hungarian Air Force on July 1, 2015. Boeing C-17 Globemaster III United States NATO strategic transport C-17A 3 Under NATO Strategic Airlift Capability (SAC) program shared uses among 12 nations. Hungarian Air force marking and international staff. Antonov An-26 USSR tactical transport An-26 2 #406, #407, active. The An-26s are due to be replaced by new transport planes after 2016. Elbit Skylark Israel UAV Skylark I 9 Hand-launched "disposable" mini electric UAV for the Afghan theatre ground troops. One was shot down in combat in Afghanistan. The Hungarian aircraft marking is a set of aligned triangles which points toward the front of the aircraft. They are the same colour as the Hungarian flag, red, white, and green. The innermost triangle is green, follow by white, and then red. It is displayed on the side of helicopters and in the standard four wing positions on aircraft. It was used by the Royal Hungarian Air Force until 1942, and then reinstated after the Second World War. The new Gripen fighters will wear a NATO standard compliant grey-on-grey (low-visibility) version of the Hungarian triangle insignia. Following the dissolution of the Austro-Hungarian Monarchy in 1918, a small air arm was established operating surviving aircraft from Hungarian factories and training schools. This air arm became the Hungarian Red Air Force under the short lived Hungarian Soviet Republic, but was disbanded upon its downfall. Under the Treaty of Trianon (1920), Hungary was forbidden from owning military aircraft. However, a secret air arm was gradually established under the cover of civilian flying clubs. During 1938, as a result of the Bled agreement, the existence of the Royal Hungarian Air Force (Hungarian: Magyar Királyi Honvéd Légierő (MKHL)), was made known. The army's aviation service was reorganized and expanded. Late 1938 the army aviation was once again reorganized. Admiral Horthy, the head of state, ordered that the army aviation should become an independent service effective January 9, 1939. Colonel Ferenc Feketehalmi Czeydner became the Air Section Chief in the Honvéd Ministry; Major General Waldemar Kenese became Inspector of the Air Force; Colonel Ferenc Szentnémedy became Chief-of-Staff, and Colonel László Háry was appointed head of the Magyar Királyi Honvéd Légierő (MKHL). It subsequently participated in clashes with the newly established Slovak Republic and in the border confrontation with the Kingdom of Romania. In April 1941, operations were conducted in support of the German invasion of Yugoslavia and, on 27 June 1941, Hungary declared war on the Soviet Union. In 1940, the decision was made to unite the Air Force, the anti-aircraft forces, and the civilian air defense organizations under one central headquarters. Colonel László Háry was retired 24.12.1940, and on 01.03.1941 the new organization was constituted. General András Littay became Air Sub-Department Chief, and Colonel Géza Vörös was appointed Head of the Air General Staff. On 01.06.1941, the Air Defense Corps was established, and Lieutenant General Béla Rákosi became Commander of Army Aviation. In effect the Air Force had once again become part of the Army. In the summer of 1942, an air brigade was attached to the Luftwaffe's VIII. Fliegerkorps on the Eastern Front. Beginning March 1944, Allied bomber raids began on Hungary and progressively increased in intensity. Late in 1944 all efforts were redirected towards countering the advancing Red Army, but to no avail. All fighting in Hungary ended on 16 April 1945. A small air arm was organised along Soviet lines during 1947. Following the communist takeover, Russian military aid was stepped up and a major expansion program initiated. When Soviet forces invaded to suppress the 1956 Hungarian Revolution, sections of the Hungarian Air Force attacked Soviet forces and resisted Russian attempts to occupy their bases. The resistance was short-lived and the entire Hungarian air force was demobilized soon after. A reconstituted air arm was reformed in the following year, but initially only as an internal security force. Gradually, starting in 1959 as Hungary became stable, the air force was expanded again, but it remained an integral part of the army and was essentially a defensive force. The Soviets kept Mikoyan-Gurevich MiG-29s based at Tokol until 1991 to defend Hungarian airspace. In mid-1993, three batches of MiG-29s were delivered from Russia. They were based at Kecskemet. In 1994, a German gift of 20 MIL 24D/V's and 20 L-39's were donated. In 1997, Hungary undertook its first flying training course since 1956. The cost of the course was too high and was halted after the completion of only one course. Also in 1997 the MIG-23s were withdrawn from service as the Su-22s were retried after an overhaul. During the 1990s all combat aircraft were fitted with new Identification Friend or Foe (IFF) systems to enable operations in Western airspace. In April 2002, Hungary joined the NATO Flying Training in Canada (NFTC) pilot training program. The 86th "Szolnok" Helikopterezred maintains the Museum of Hungarian Aviation, which has the largest collection of "retired" military aircraft in Hungary. Some aircraft are also displayed at the Kecel Military History Park. First roundel of the Hungarian Red Air Force in 1919. Second roundel of the Hungarian Red Air Force in 1919. Third roundel of the Hungarian Red Air Force in 1919. Roundel of the Royal Hungarian Air Force between 1938 – 1941. Roundel of the Royal Hungarian Air Force between 1942 – 1945. Roundel of the Air Force of the Hungarian People's Army between 1948 – 1949. Roundel of the Air Force of the Hungarian People's Army between 1949 – 1951. Roundel of the Air Force of the Hungarian People's Army between 1951 – 1990. Roundel of the Hungarian Air Force between 1990 – 1991. Roundel of the Hungarian Air Force from 1991. Roundel of the Hungarian Air Force, low visibility version. ↑ "The Military Balance 2014"., 5 February 2014. ↑ "Scramble". Retrieved 23 December 2014. 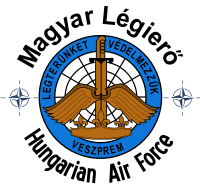 ↑ "Hungarian Gripens police Slovenia". AIRheads↑FLY. Retrieved 23 December 2014. ↑ "Hungarian Gripens get CAS role". AIRheads↑FLY. Retrieved 23 December 2014. ↑ "Hungary brings forward CAS programme for its Gripens". Retrieved 23 December 2014. ↑ "Farnborough 2014: Hungary seeks air-to-ground weapons for Gripen". Retrieved 23 December 2014. ↑ "Hungarian air-force may police Austrian skies". Retrieved 23 December 2014. ↑ "NATO shelves plans to procure additional SAC aircraft". Retrieved 23 December 2014. ↑ Dorschener Air International February 2014, p. 72. ↑ "Megjöttek a használtan vett orosz helikopterek Kecskemétre". hvg.hu. 3 April 2014. Retrieved 2014-04-03. Dorschener, Jim. "Hungary's Fleet Revolution". Air International, Vol. 86, No. 2. February 2014. pp. 72–75. ISSN 0306-5634.